Mixed media artist Jeff King has come a long way since his breakout solo show, Something Is Over in 2006 at the nomadic Moving Gallery in the Old Market. The title more than hinted at a determination to focus more on his painting and less on the culinary arts, the career that sustained him for the past 15 years. Paperwork, the show’s signature piece, spoke eloquently in his now familiar graffiti-influenced style of his need to break away from his “daily grind” and concentrate more on what sustained him. But new beginnings for any emerging artist can be difficult. Five years later, King is still balancing both forms of art as a baker at UNMC and as an influential area painter. Witness this at his current show at the RNG Gallery, called ironically, the newest edition of what you’ve been missing, which continues through August 21. King says he’s “not an angry young man anymore.” Though the issues that trouble any emerging artist, particularly survival in the marketplace, still permeate his work, his style and POV have evolved as seen in his current show at RNG. This “newest edition” is still personal, but he’s more the observer allowing for a certain irony and satiric edge about content King still feels deeply about. 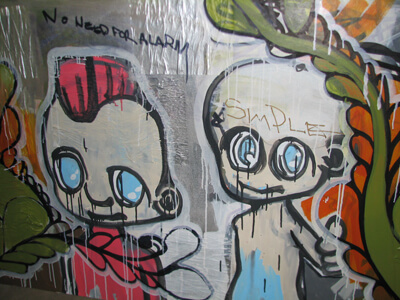 The show’s statement describes the 15 medium and large format mixed media paintings as “witty,” populated largely by post-Smurf love children in an Anime aesthetic. The graffiti influence is still there but mostly in the background with its characteristic script and signage on textured and scarred surfaces. Figures are caricatures outlined in black as if done on the fly. Jarring notes of neon color look sprayed on. Yet the overall visual effect is deliberately and deceptively sophisticated in spite of being referential. With a few notable exceptions, King’s mixed media here is dominated by a weak-chin cartoon figure with an overbite, Pinocchio proboscis and vacant or shuttered eyes, helmet hair and drawn with an Anime flair. Most of these caricatures are floating heads in a kind of suspended animation as if these scenarios began as day-dreamscapes and ended up as cartoon bubbles on canvas. The tone or POV varies from satiric, self-analysis to more blatant social criticism, especially of art’s inner sanctum, socially and economically. There are lessons for all here or at least windows of clarity—some less veiled than others—that expose issues of insecurity and insincerity, hypocrisy and redundancy and expediency and materialism that encompass collectors, critics, galleries and artists alike, including himself. At times the veil is lifted and his “text-messaging” in his imagery speaks for itself and points in several directions. Phrases like “Fake Gold,” “I’ll be consumed by my own fire,” “No need for alarm” and the more blatant “Instant Masterpiece” indict all in the nebulous market of creativity with all of its risks and contradictions. There Are No Rules, which could be the show’s signature piece. In the image, a solitary caricature, sporting the longest nose of all, is caught in a downward spiral of swirling black lines. Pink and flushed, this figure of authority is apparently caught in a lie that frustrates the artist who may wish that there were rules as long as they served him as well as the status quo, everyone operating on a level playing field. In Plastic Clique, an “ordinary” figure is surrounded by a like circle with similar but longer noses than he. It’s a familiar conundrum for an artist: to stand alone from the crowd or sell out and become one of the anointed. That he already shares their bubble within the frame may be a sign of the inevitable in order to succeed. Another fear dealt with exists in Gorillas in Captivity in which the proverbial 500 lb. variety in the room is devouring the artist. No matter how one interprets this, whatever it is that consumes him here, his own passion, insecurity or outside pressures and obligations, it threatens to make a Fixed Monkey out of him as seen in Gallery 2. Back in Gallery 1, another group of poseurs living a lie and getting away with it, is the group shot, Wack MC’s with their “false gold” text and long noses. Yet even more interesting than its theme here is King’s talent for dynamic composition that, along with Plastic Clique, focuses attention and navigates the eye to, away and then back to its central figure. Another sign of King’s artistic evolution is his interest in the young and the naive, a product probably of his mentoring as well as personal experience, as seen in the rather static 1994 with its subtext of “Children Can’t Reason with the Businessman” and the more visually interesting Simple Minded Fools in Gallery 3. In the foreboding latter two innocents, wide –eyed and vacuous, walk the streets or primrose path while a villainous adult lurks in the shadows. This is paradise lost and innocence is prime for the picking. Finally, the exhibit ends rather cryptically, pun intended, with the grammatically incorrect The Dead Lives Elsewhere. In another interesting and dynamic composition, five floating heads with King’s familiar arrows pointing to all, turn an oxymoron into a paradox, suggesting that negative energy has a perpetual life and influence of its own. King may no longer be “that angry young man,” but this “newest edition” has sharpened both his tongue and powers of observation.